Thanks for this, it really clears a lot up! Thank you so much! Now i know how to connect a led that is shining when the effect is activated. Thank you very much. I have a metal surround DC power connector, which of course is running off of a negative tip connector. That is why my EQ effect I built was not working. After drilling the hole slightly bigger, fitting a rubber grommet in, I finally have it working. It seems like the center pin of the 9V connection, is not connected via the - side of the battery, but it's just grounded directely. 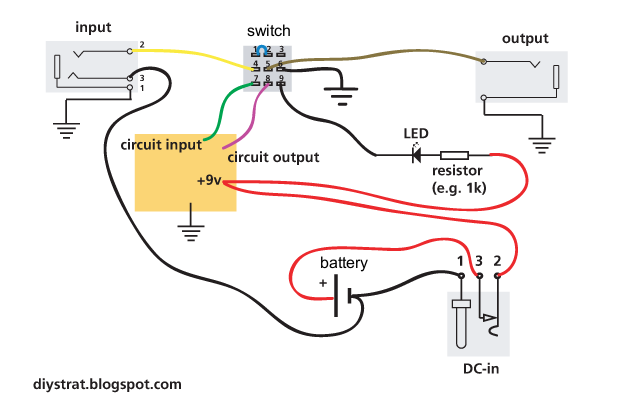 Does that mean that once the 9V plug is inserted, the circuit is working, even if the input jack is not inserted? Could that cause hum, even if the guitar is not connected? Hi tdale. 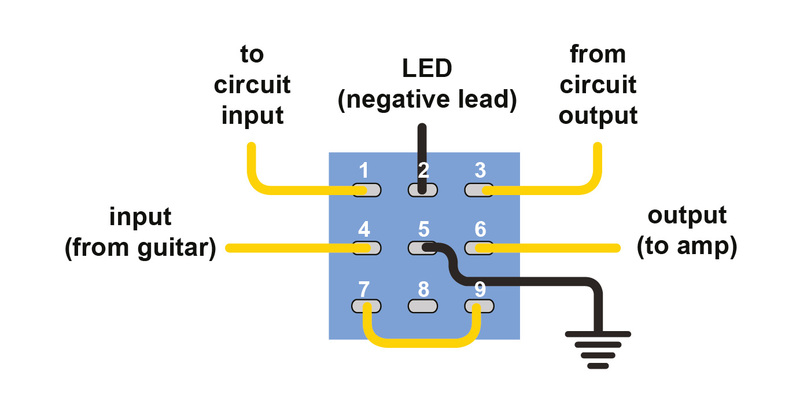 Yes, you're right, the power supply's negative goes straight to earth, so it will always be using power, even when the input jack is not connected. However, apart from very small amount of power wastage, there won't really be any negative effects. 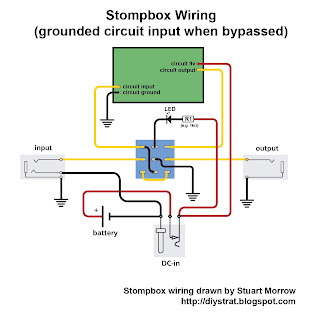 Hi - not sure if this is the appropriate forum but i was wondering if it is possible to add a switchable trigger/gated pulse input that would close the stomp pedal switch? my application is to send clock signals from synth/modular equipment that will activate the tap tempo of my stomp pedal, i think a momentary switch to allow the trigger pulse would be sweet as i could hold for 5-6 tap tempo and release to set. Hi there , thanks for this post. One stupid question, how do you know what is the pin 1 of the stompswitch? So why cant you just use a center positive jack or wire it for center positive? Im sitting on some jacks and cent+ wall warts right now that I've wired up for center positive and power circuits just fine. Why do people wire center negative? @MrJohnny56789 : most of the guitar pedal supplies follow this "standard". Not the most fortunate, I know, just this is what stuck. Think of the pedalboards with central power source. They follow this rule, and inverted polarity would render your pedal incompatible with these supplies. Excellent explanation! Thank you! I am a commerce graduate. I a hobbyist and trying to make to mini rotary tool at home. I did not understand how to connect wires to a female dc pin. Your post helped me a lot to understand the positive and negative pin.